I learned about this when my friend Carla posted it on her blog. It looked so fun and easy I just had to give it a try. All it took was 3 bars of Ghiradelli white chocolate, and 3 bars of Ghiradelli dark chocolate. 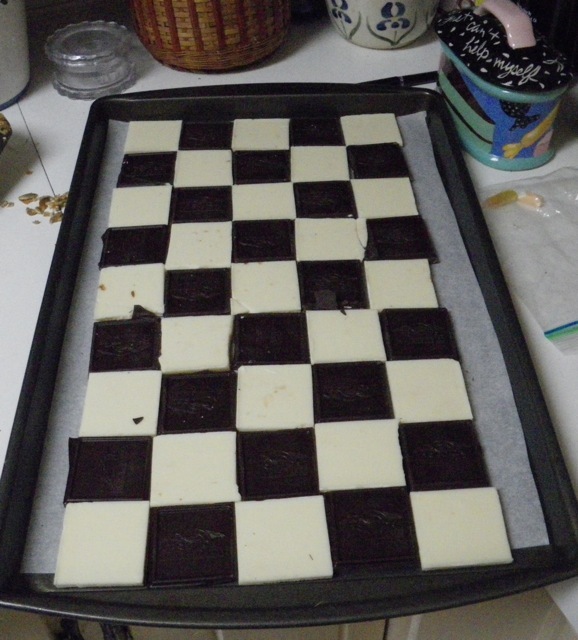 Line a cookie sheet with parchment, break chocolate into squares, place on parchment alternating the light and dark squares. Place in a 225° oven for just 5 minutes. 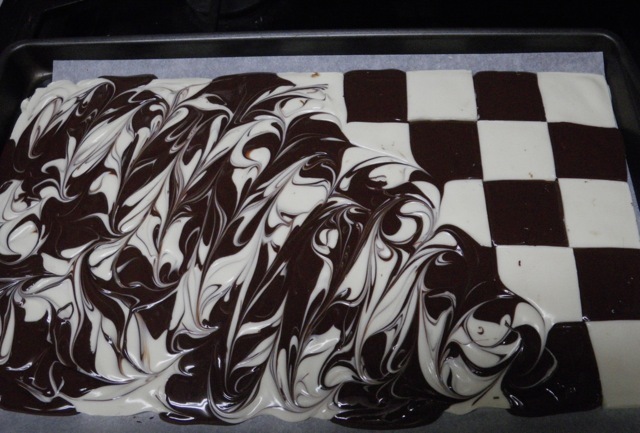 Take the sheet out and swirl the chocolates into each other. The sprinkle with sea salt and chopped nuts. (Oops. I forgot the nuts, oh well. It still tasted good.) Cool in the refrigerator until the chocolates harden, then break into pieces. It’s better to store it in the refrigerator, too, since the chocolate tends to stay a little soft. well, this begs the question…..do i have to go to the grocery store tonight? or can my excitement about trying this WAIT till i do my holiday meal shopping tomorrow?! If you shop tonight, you might need to buy more supplies tomorrow! Maia will love it. 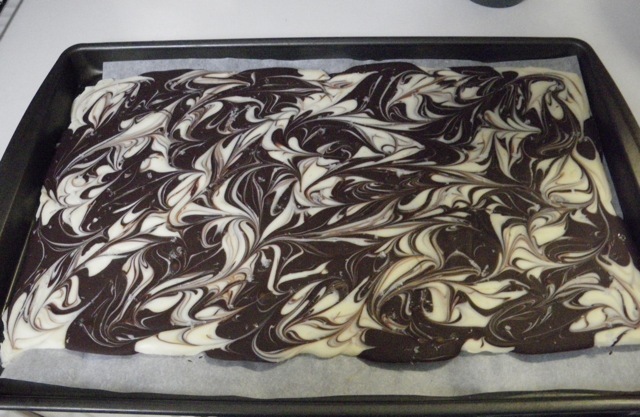 It would be better with nuts, but I was afraid I wouldn’t be able to see the swirls! That’s the most beautiful swirled dessert ever! My swirled cheesecake never looks that good! This recipe was seriously easy! Oh My! That looks really yummy………….Have a lovely holiday and don’t eat too much! Right! So far I’ve only eaten a little bit….sort of…. Looks yum! I love the chocolate and salt combo. Will have to try this sometime. Susan you won’t believe how easy this is! And it tastes great. I love the salty sweet combo. If this was a batch of salt caramels, I would have none left to photograph. Carla, it was so satisfying and quick to make! Thanks for the idea!